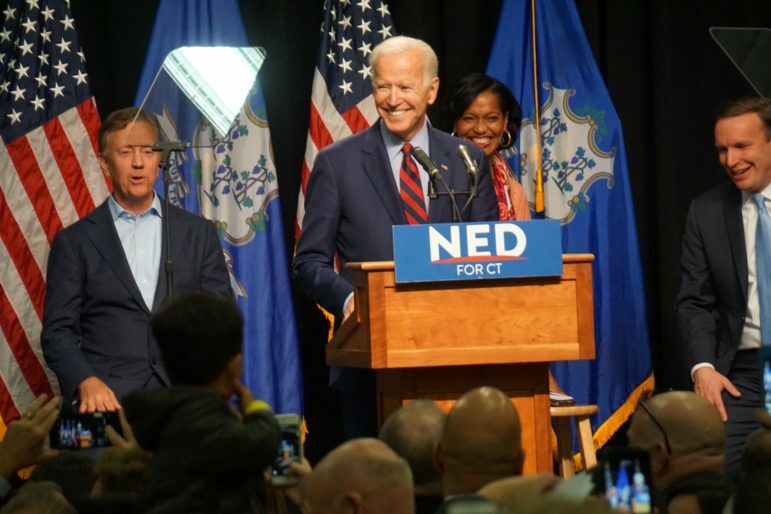 Joe Biden, with Ned Lamont, Jahana Hayes and. Chris Murphy, during Lamont’s campaign for governor. Washington – After a Connecticut woman accused former Vice President Joe Biden of touching her inappropriately, his office stepped up its defense of the Democrat who is weighing a run for the White House. Other women on the list work or once worked for Biden. The controversy over Biden’s behavior towards women ratcheted up after Amy Lappos, who once worked for Rep. Jim Himes, D-4th District, posted on social media about Biden touching her inappropriately during a fundraiser in 2009. Using the pseudonym “Alice Paul,” Lappos made her allegation during a Facebook debate over accusations by Nevada Democratic politician Lucy Flores, who said Biden once smelled her hair and kissed her on the back of the head. “Biden did something similar to me at a fundraiser in Greenwich when I was a Congressional Aide,” Lappos wrote in a post last weekend on the Connecticut Women in Politics Facebook page. “I can speak from experience when I say it’s an incredibly uncomfortable situation and not at all acceptable. We need to hold our men to the same standards we hold all men,” Lappos added. Biden has not addressed Lappos’ allegations, which were first reported Monday in the Hartford Courant. But he said that although he did not recall the alleged incident with Flores, it’s important for women like Flores to be heard. House Speaker Nancy Pelosi, D-Calif., also came to Biden’s defense Tuesday, telling Politico the allegations against Joe Biden of unwelcome contact are not disqualifying for a 2020 run, but that the former vice president should be more aware of others’ personal space. “He has to understand in the world that we’re in now that people’s space is important to them, and what’s important is how they receive it and not necessarily how you intended it,” Pelosi said. Connecticut’s lawmakers have been silent on the issue.